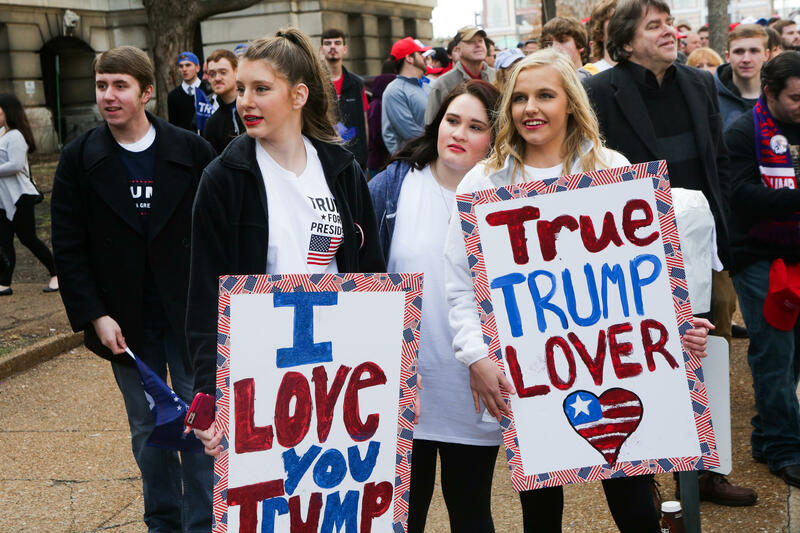 Fans of Donald Trump converge in St. Louis last week. The billionaire businessman won Missouri's presidential primary over Ted Cruz. It would be a big stretch to say that Hillary Clinton and Donald Trump pulled off yuge victories in Missouri’s presidential primaries. As of Wednesday morning, the pair's apparent wins are so small that the Associated Press has refrained from declaring either presidential contender the winner. But for now, Clinton and Trump are the toast of Missouri. And barring some sudden change, the results will have a different effect for each candidate. Hillary Clinton etched out a narrow victory in Missouri. For Trump, he’ll likely take a good chunk of Missouri’s delegates along on his unconventional and front-running presidential run. And Clinton’s win avenges a tight loss to then-Sen. Barack Obama in 2008, even though she’ll likely split the number of delegates with U.S. Sen. Bernie Sanders of Vermont. It’s hard to think of too many commonalities between Trump and former GOP presidential nominee John McCain. Lest we forget how Trump got into quite a bit of hot water when he crassly dismissed the Arizona senator’s heroism during the Vietnam War. U.S. Sen. John McCain won the 2008 Missouri Republican presidential primaries. But Trump wouldn’t have won on Tuesday without getting more votes in Missouri counties that McCain prevailed in during his 2008 presidential campaign than his nearest competitor, U.S. Sen. Ted Cruz of Texas. Trump got about 15,000 more votes than the Texas senator in those counties -- which was more than enough to win. The reason for that result? Trump did better than his rivals throughout the St. Louis region, carrying places like the city of St. Louis, Jefferson County and Franklin County. There is also another eerie parallel: Very few prominent Missouri Republicans backed McCain’s 2008 presidential bid. And with exception of a handful of political figures like Eagle Forum President Ed Martin or Eagle Forum founder Phyllis Schlafly, it’s safe to say that even fewer GOP bigwigs got behind Trump’s endeavor. 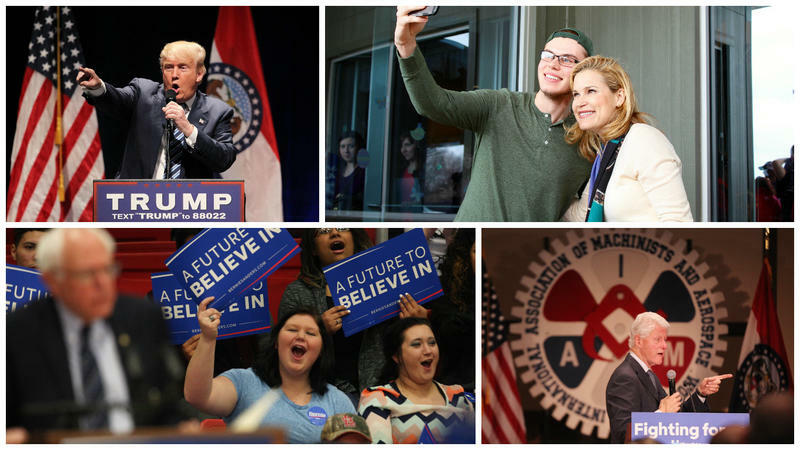 Trump and Sanders aren’t the most obvious politicians that would catch on in outstate Missouri. After all, Trump is a brash New Yorker who previously expressed support for abortion rights and gun control. And Sanders is a self-described Democratic Socialist who is probably well to the left of many rural Missourians. Trump supporter Tom Mendenhall watches Donald Trump speak on television screen at the Sheraton Westport Plaza during the Lincoln Days convention. University of Missouri-St. Louis professor Dave Robertson said both candidates likely benefited by striking harsh tones against the country’s trade policies. Sanders’ outstate margins were especially surprising, given how well Clinton did against Obama in rural Missouri in 2008. One person who has run statewide numerous times -- former Missouri Gov. Bob Holden – has a theory on why Clinton wasn’t able to replicate that result. Back in 2008, former Arkansas Gov. Mike Huckabee nearly won Missouri after sweeping most of rural counties in the state. It seemed that a candidate who could replicate Huckabee's path would have a good chance at winning in the Show Me State. Former Arkansas Gov. 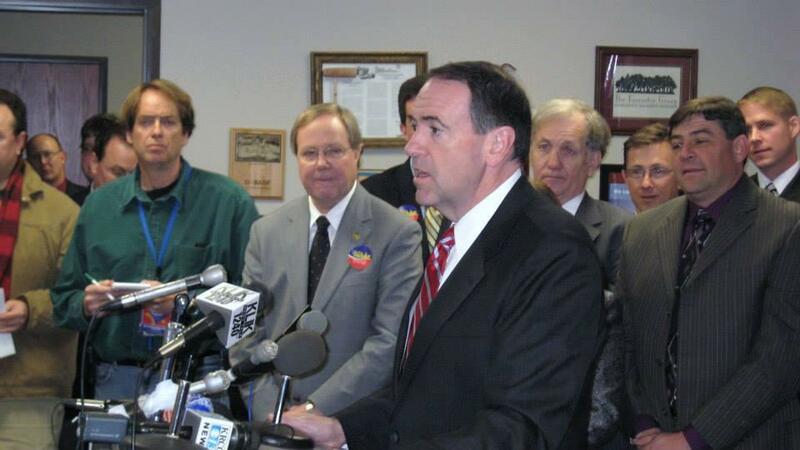 Mike Huckabee campaigns in Missouri back in 2008. He nearly won the Show Me State over McCain that year. But Cruz and Trump basically tied in counties that voted for Huckabee: Cruz got 149,473 votes, while Trump nabbed 143,942 votes. The reason for the split is relatively straightforward. Trump managed to win most of northern and southern Missouri, which contains scores of low-population counties. Cruz did fairly well in southwest Missouri, which is the home base to one of the largest contingents of Republican voters. By the way, Cruz got about 5,000 more votes in counties that former Massachusetts Gov. Mitt Romney carried in 2008. That includes places like Boone County, home to the University of Missouri-Columbia. Tuesday was a pretty terrible night for U.S. Sen. Marco Rubio, whose political career likely came to screeching halt after he lost his home state of Florida to Trump. Former U.S. Sen. 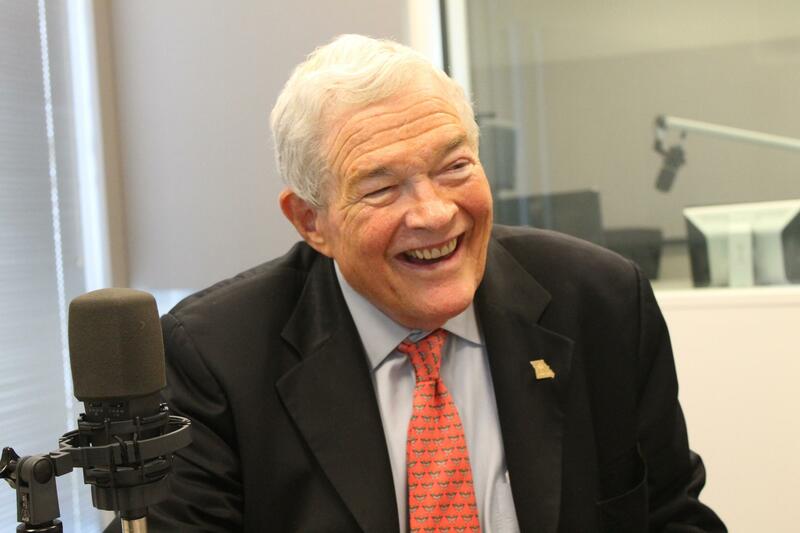 Kit Bond's late endorsement of Marco Rubio had little impact on the Florida senator's trouncing in Missouri. And things weren’t much better for Rubio in Missouri. Despite getting the endorsements of some the heaviest of GOP heavy-hitters – including former Sen. Kit Bond, House Speaker Todd Richardson, and Senate President Pro Tem Ron Richard, R-Joplin – Rubio came in fourth in most of Missouri’s counties. In essence, he and Ohio Gov. John Kasich became spoilers for Cruz as opposed to substantial contenders. This reporter wondered if Trump was making a strategic error in holding rallies in the heavily Democratic cities of Kansas City and St. Louis. After all, Ted Cruz held events where many Republicans actually reside: western St. Louis County, Cape Girardeau and Springfield. 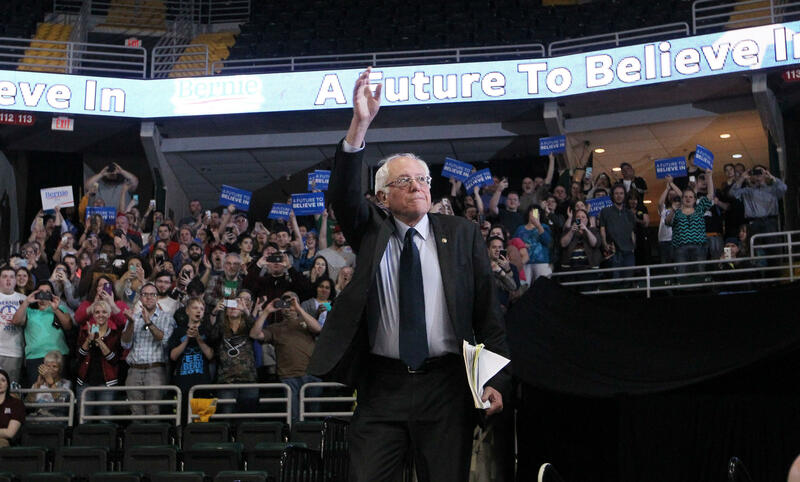 Democratic Presidential candidate Bernie Sanders waves to the crowd during a campaign stop in St. Charles on March 14. On the flip side, it seems that Sanders’ decision to hold a rally in St. Charles paid off: He won that traditionally Republican county by nearly 10 percentage points. That may provide credence to the idea that showing up is half the battle when it comes to presidential politics. After Ben Carson bowed out of the GOP race for president, there was speculation about where his voters would go. And it's not out of the question that many of his supporters gravitated to Trump, especially after he offered his endorsement last week. Former Republican presidential hopeful Ben Carson got more votes than Trump's margin of victory. But it’s not just his endorsement that helped Trump in Missouri. 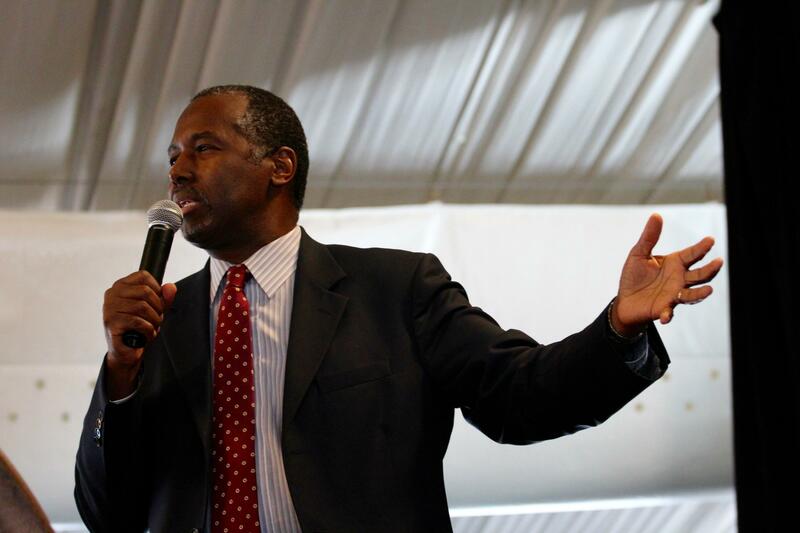 Carson’s name remained on the ballot, and 8,197 people decided to vote for him. If a slice of those people had decided to vote for Cruz instead of pulling the lever for someone who is no longer running for president, Tuesday’s result would have been different. Carson wasn’t the only non-candidate that Missourians voted for on Tuesday. In a development that could only be described as confounding, 3,213 showed up to the polls to declare that they were uncommitted to a candidate. That's some real, um, dedication. In most presidential election years, primary voters in Missouri and Illinois often wouldn’t have that much impact on picking potential commanders in chief. But 2016 isn’t like most presidential years. Inside a packed basketball arena in southern Illinois, Democratic presidential contender Bernie Sanders’ made Weasel Forsythe’s day. 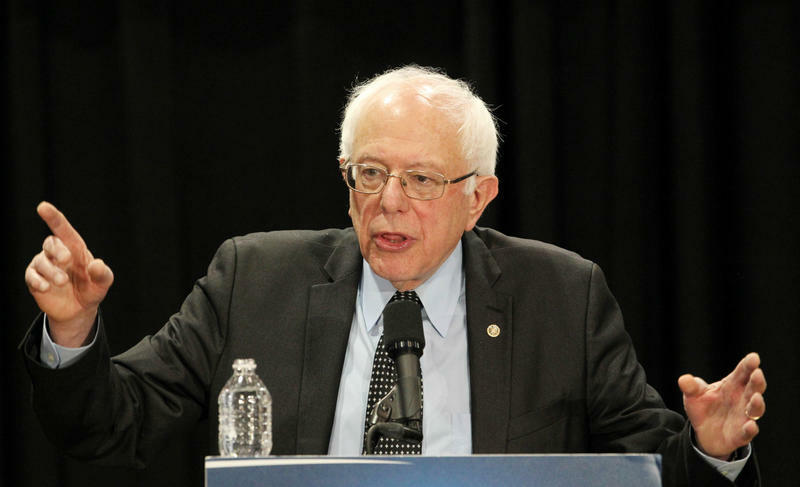 Forsythe was one of several thousand people who saw the Vermont senator speak Friday on the campus of Southern Illinois University - Edwardsville. When Sanders was through with a roughly 50-minute speech, he gave Forsythe a hug. Democratic presidential Bernie Sanders is banking on Missouri primary backers to provide the campaign boost that he got last week by a surprise victory in Michigan. 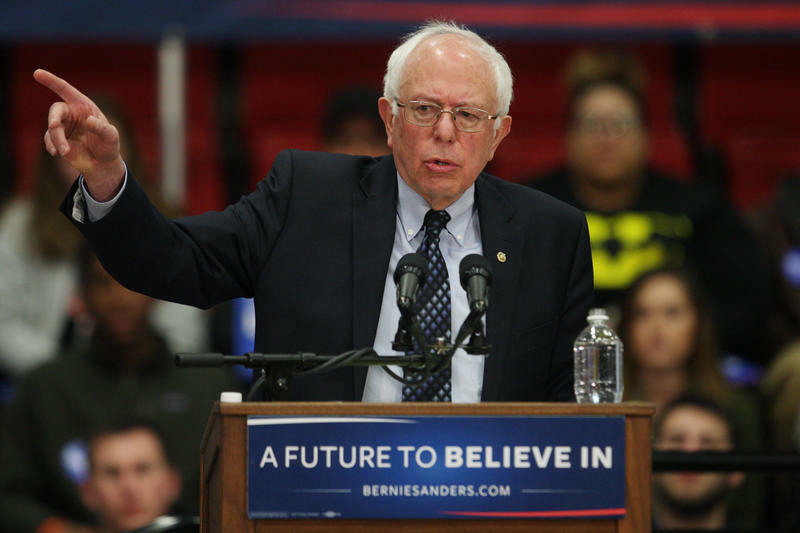 Sanders’ stump speech makes a point of reaching out to all ages and all ethnicities. Still, it’s clear that his appeal is particularly strong among those of college-age, many of whom embrace his promise of tuition-free education at public universities and colleges.